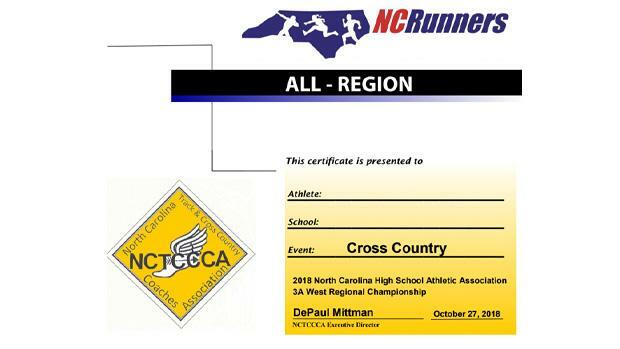 Starting this year NCRunners and the NC Track & Cross Country Coaches Association (NCTCCCA) has come together to recognize All-Region and All-State athletes for this years championships. Prior to this year there was just an informal recognition that the top 10 athletes at the regional or state meet were considered All-Region or All-State. The NCHSAA does not officially recognize All-State or All-Region for any sports and reserves this honor for Coaches Associations and media outlets. Regional directors have been sent All-Region certificates that they will either hand out at awards or will send to the schools to print out for their athletes after the meet. For the state and regional meets we'll recognize the top 10 boys and girls in each region and classifications. In Cross Country for All-State the Kernersville News will also be a press co-sponsor as they have done in the past. We'll have an article out after regionals recognizing the All-Region athletes from each respective region. Best of luck to everyone racing this weekend!